I would consider myself to be a ‘glass half full’ kind of guy and pretty grateful for everything the universe sends my way. However, I have one professional regret, that four years ago, in order to focus on my role within MAHSC (now part of Health Innovation Manchester), I made the conscious decision to stop doing research. I’m paraphrasing an old cliché now, but you can take the boy out of science, but you can’t take the science out of the boy! I miss it terribly. I now live my scientific career vicariously through the work of my career idols, those who get to do research every day! I love hearing about new discoveries or where research has made its way across the translational pathway and is now touching the lives of our population through experimental medicine conducted in our BRC, CRF, PSTRC and ECMC, or through clinical trials and other complex interventional studies conducted in the Trusts and at the University of Manchester. That’s made even sweeter when I see it has a ‘Made in Manchester’ label! So, I can’t tell you how excited I have become over the last few weeks as my role within HInM has enabled me to visit the Universities of Salford, Bolton and Manchester Metropolitan University to connect with their senior leaders and research communities in order to understand their research expertise and infrastructure and begin to connect it to the fabulous research, expertise and populations within the GM health economy and the health and social care priorities of the GM population. Last week, I began my journey of ‘scientific rediscovery’ at the University of Salford where I had the privilege to meet with three of their senior academics, Professor Chris Nester, Professor Laurence Kenney and Professor Richard Jones to learn about their research programmes in the School of Health Sciences. I spent six wonderful hours spellbound as I listened to and then began connecting their academic strengths to those of colleagues at the University of Manchester, and our research active NHS trusts in a way that was complementary and would add value to all concerned. During my visit, I was introduced to members of their labs, saw some amazing facilities and was ‘spooked out’ by a technique they have developed to stimulate muscles that have become weak as a consequence of stroke which can be used as part of a rehabilitation programme. I have some great video of the technique (Functional Electrical Stimulation) being demonstrated to me by one of Professor Kenney’s Post-Docs! During my conversation with Chris Nester a podiatrist and leading authority on foot health, I began seeing some collaboration opportunities to link in his research and connections to well-known industry partners particularly with clinical and academic communities working in wound healing and those involved in frontline diabetes care. 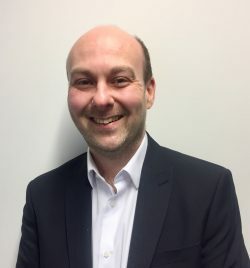 Chris is also very keen to explore the use of digital solutions to provide a holistic approach to foot health – I will be putting Chris in touch with our CEO, Ben Bridgewater as I can already see a number of applications that will play to Ben’s passion for healthcare related digital solutions. Chris told me about how he was keen to explore with our mental health community how loss of mobility leads to mental health problems. I was also very interested to learn about Chris’ interests in the public health and health behaviour and the general public’s attitudes to foot health and care – something that should definitely get more air-time than it currently receives. You can learn more about Chris’ work by clicking here. I was then introduced to Professor Laurence Kenney, who co-leads, with his colleague, Professor Dave Howard (School of Computing, Science and Engineering) Salford’s research in biomedical engineering and rehabilitation technologies. We talked at length about a number of exciting research studies including the functional electrical stimulation technique that I mentioned earlier, that could be used as part of a rehabilitation programme for hemiplegia following stroke. Of specific interest was a project that Health Innovation Manchester has recently funded through one of its innovation awards. Dr Sibylle Thies has led the development of a new and objective approach and associated instrumentation to characterise the stability of users of walking aids. There is a high prevalence of walking aid use in the most vulnerable older age category, and because walking with a frame differs significantly from unassisted walking in a number of ways that include the need to coordinate the device with body and foot movements, and significant changes to the base of support over the ‘gait cycle’, the direct use of unassisted stability measures is often inappropriate. To date three types of instrumented walking frames (“Smart Walkers”) have been developed and are currently used to assess walking aid users inside the lab and also in their own environment. In the final instalment of my visit, I met with Professor Richard Jones whom I have known for a number of years dating back to when I was the Associate Director for Research at Salford Royal and Salford PCT. It was great to catch up with Richard whose enthusiasm and love for what he does has not waned over the years. In fact, his energy, as he spoke about what he’s currently doing, was off the scale! Richard told me about his involvement in the Manchester Institute of Health and Performance, a state of the art centre created to deliver excellence in every area of sports science and medicine that brings together leaders from elite sports, grassroots community sport, world-class healthcare and local government to deliver cutting edge facilities to the local community whilst driving ground-breaking research with global applications. The facility is funded by Manchester City Council, Sport England and City Football Group and is operated by HCA Healthcare UK. Working with local academic and clinical partners it promotes the health benefits of physical activity and fitness in the everyday lives of the community. As we spoke, the cogs began to turn as started to think about how our clinicians and scientists across Greater Manchester could interact with the MIP to bring their expertise to an environment that is already promoting research in areas such as providing children with the best start, engaging the population in improving their own health and well-being and playing its part in moving healthcare into the community. All of which sounded very familiar as I thought about the health and social care priorities of Greater Manchester and how we bring our academic assets in research and education from across the four local higher education institutions to best deliver these for the population of Greater Manchester. What a brilliant opportunity! I am also looking forward to my invite to go and look round the MIP (big hint, Richard)! I have promised to stay in touch with Chris, Laurence and Richard as I am extremely keen to connect them to others within the Health Innovation Manchester family who would be very interested in exploring further collaborations. In six hours, and talking with just with three people, I started to realise the enormous potential we have by combining the academic strengths of our four local Universities to create a GM Powerhouse of Research, Education and Innovation. I left the University that day having rediscovered my love of science and feeling very excited about the future of our academic health science and innovation system. This is only the start. I have at least another two visits to Salford to meet with others within the School of Health Sciences before planning similar visits to the School of Computing, Science and Engineering, the School of Environment and Life Sciences and the School of Health and Society to find out about their hidden gems. And let’s not forget, I’ve still to embark on my explorations of MMU and University of Bolton.